Happy last day of the month everyone! Thanks for all your comments and support this month. Your everyday in May drawings are absolutely unbelievable! I wish I could draw like that! It would alone take me ages to color all these details! The incense looks just perfect: the shiny vessel, the ember on the incense sticks, the smoke!! Awesome work! What a lovely series of drawings you've made for EDiM. This incense holder is just lovely. This is a wonderful drawing! Congratulations--you have done it--every day in May!! I will be very sad if you stop posting your art. I have enjoyed stopping by every morning to see what you have done. Not only is your art great, but you give me a taste of the culture you live in. It has been so enjoyable! Thank you!! Congratulations on making it through the month. I really enjoyed the collection. Your style can make everyday items look so beautiful. Even rope and a mosquito coil. Thanks for sharing these with us, very inspiring! Wow, this is so detailed! All your drawings are amazing, the texture and lights are so well rendered, and they're so beautiful! Your drawings are beautiful! I be visiting your blog regularly. You have such interesting objects all around you where you live. Beautifully drawn - love the intricate designs on the sides. Well done! Your painting is so baeutiful! I love all of the detail that you add to ceramics and textiles. ha ha too funny. I love your whole set Debra. Congratulations on finishing EDiM. I thoroughly enjoyed your EDMay challenges! You always do such beautiful work. Thank you for that wonderful email describing your process! You mentioned storms had kept you away, and then we got storms! Lost our power for 6 hours! There's just so much to admire here! 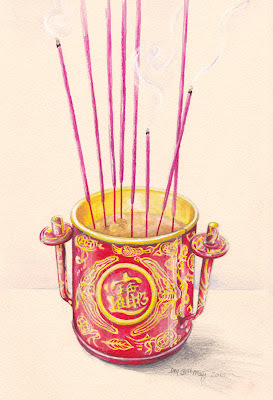 The designs, the chinese character, the tip of the incense, the shine of the holder....everything's just perfect!